"The children adore you! We never had so many compliments from parents as we received this year due to hiring TREVOR. Thanks!" "TREVOR "The Games Man" is terrific!! Everyone had a blast this evening!" Party Under The Stars, the culminating event for summer reading at Farmington Libraries, was a big hit for families, who were entertained by the TREVOR "The Games Man" with participatory activities and a craft." "Just want to say you are wonderful, TREVOR. You put on a great show. What I love most are the cooperative games you play with the kids. It's so interesting to watch children whose only experience of play is win/lose open up to a whole new mode of play where it's FUN no matter what. The first time they get tagged, you see disappointment on their face. It's so great to watch them realize that they haven't lost, they've just changed sides or modes of being and can still play. The FUN continues. I wish schools and parents could learn from you, but then I realized I wish the whole world could learn that life doesn't have to be a zero-sum game: we really can all get along and keep playing together if we can let go of the idea that one person needs to be on top. You bring a little bit of heaven into the world everywhere you go." "What a wonderful job you did keeping all the children focused and involved, that was great! The kids just loved it and are still talking about it. You were awesome. With 26 kids at a birthday party to run so smoothly and for every child to participate was wonderful. We will definitely invite TREVOR again." 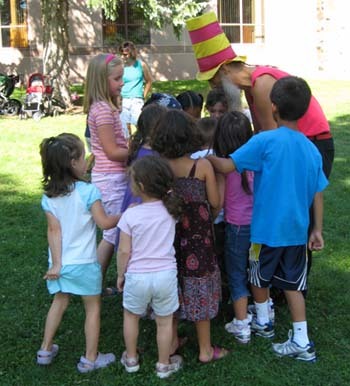 "For a whole hour, you kept 70 children ages 6-16 smiling and active and doing games together. 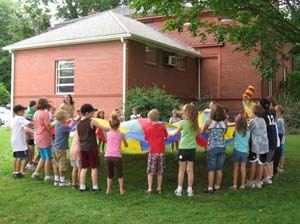 Everyone had a great time, and you introduced some games that the counselors used later on. I hope you never burn out!" "You put on such a FUN show!!!" "There was just a magic in the air when you had your parachute out!" "Looked FUN, whacky, zany, Seuss-like. 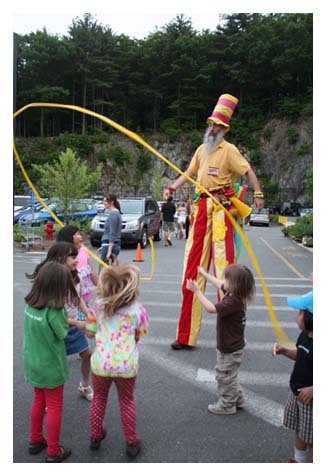 Very entertaining, great with kids. Unique, audience enjoyed thoroughly. I especially liked the level of laughter and excitement the audience displayed during the performance. Feedback has been all positive. TREVOR is a true showman! The audience was delighted with his show." "You were God sent! According to all in attendance, your performance on the green was outstanding. I have had several calls to say you were great. Next year, please plan to repeat your performance. Thank you again for a wonderful finale." "On behalf of the Hampden County Area Special Olympics, thank you for your part in the Fall Harvest Festival. It was so nice to see youngsters spell-bound by human entertainment rather than by television. Again, our thanks for making it such a delightful event." "Thank you for coming to the Orange Arts Festival in the park. Several adu lts have commented on your wonderful "playtime" with the kids. And from the kids' reactions, I'm sure they enjoyed you." "Your presence was so enjoyable by all at the Holiday Fair. Thanks so much for your time and energy. You have a remarkable gift and it's wonderful to see you share it." "I've seen what TREVOR does. He is very good." " TREVOR, the answer to my cooperative games prayers!" 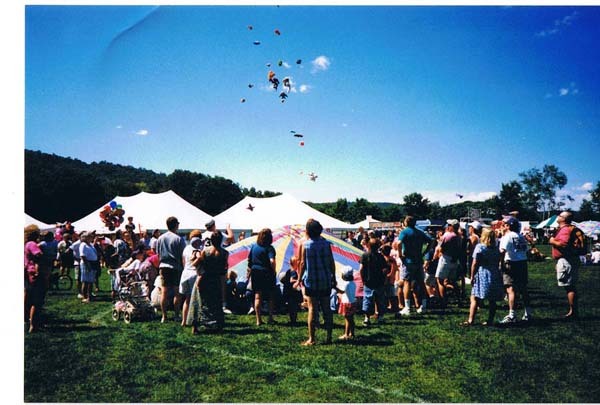 "We would not consider celebrating completion of a fun-filled school year without TREVOR. He brings joy to everyone --- teachers, parents, grandparents, and children of all ages! It is a pleasure to see whole families involved in the play that TREVOR brings to our end-of-the-year celebration! Looking forward to seeing you again next spring!" "TREVOR was on time and needed no direction whatsoever. Children and adults alike were entertained. 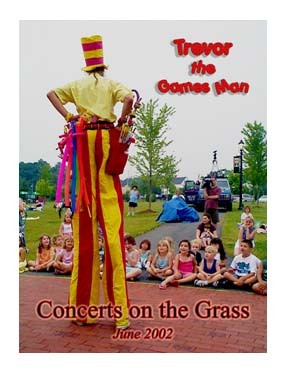 TREVOR is the most experienced and FUN entertainer I have seen. He is a true professional. I knew I could count on him, and he came through." Click here to see what these comments are all about.